Have you ever confronted with the message “Login to Proxmox Host Failed”? Are you looking for a solution? When a user directly accesses the Proxmox VE management console or while integrating the third party modules such as WHMCS into the Proxmox server or during cluster management of Promox nodes, the “Login to Proxmox Host Failed” gets displayed. After getting this error message, Most of the time the users get confused. For a while, we have been addressing the server related issues in our blogs. This time, the blog provides everything you should need to know to fix the “login to Promox Host Failed” error. All the issues pertaining to SSL certificate can be solved using this command. The “Login to Proxmox Host Failed” error can be caused by firewall rules in Proxmox. Since the firewall rules are crucial for server security, instead of avoiding it, we need to configure the rules correctly and is vital for effective server functioning. Web interface at port 8006, pvedaemon, SPICE proxy at port 3128, rpcbind at port 111 and sshd at port 22 are the ports used by Proxmox VE 4.x. If you use firewalls such as iptables , it leads to proper functioning of the Proxmox Server. For this the firewall rules have to be added in the Proxmox server for the corresponding ports. Add a rule to accept loop-back interface connection for proper internal communication in the Proxmox server. It is important to ensure the status of the connectivity (proper or not) between the two servers in the case of the third party modules such as Modulegarden, WHMCS, etc. Since the login problem can occur due to connectivity problems, try to use the telnet command. Of course, you can flush the firewalls in order to avoid connectivity problems but it is not advisable due to the security issues. So you need to deny everything else in order to allow the required connections. Most of the servers rely on NTP service for updating the server time zone. Due to connectivity errors or other service related errors, the NTP server sometimes fails to sync the server time. The issues with server time are not only caused by NTP service but also due to the difference in time zone. The lack of clock synchronization leads to incorrect server time and which leads to the login failures. So for the smooth functioning of the server, proper clock synchronization is crucial. So always remember to keep your server time updated which helps to avoid log in errors. Use the password of Proxmox shell which is defined during the proxmox installation to access the Proxmox VE management. Always use a strong password for the server protection but not complicated ones with a lot of special characters. It can cause severe login issues. Another reason for password issue is the bugs in Proxmox authentication module which is used to validate the login details. If all these fail, go for resetting the node password with simple words and try to log in. 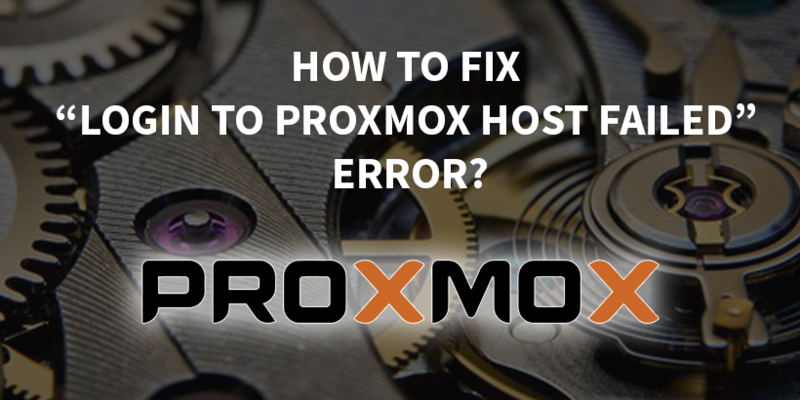 Unlike other server errors or issues, The “Login to Proxmox Host Failed” occurs due to reasons which are completely interdependent. So it is difficult to understand the root cause of such errors. The reasons range from the expired SSL certificate, issues with firewalls, incorrect server time and password issues. So this blog helps you to understand the most common causes for The “Login to Proxmox Host Failed” error. The issue should be analyzed with prior study and care. If you have identified the wrong cause, the solution which you implemented may even affect the server operations itself.